So The Daughter is going through a very exciting time right now, and as a very proud mommy, I thought I would share a recent article about her from the local paper as my blog this week. The Daughter’s performance on the volleyball court hasn’t gone unnoticed. The Stouffville resident was recently chosen to play for Team Ontario that will take the hardwood court for the National Team Challenge Cup at the University of Manitoba in Winnipeg, July 16 to 20. A student at Stouffville District Secondary School an member of the Spartans’ senior girls’ volleyball team this past season that competed at the Ontario Federation of School Athletic Associations AAA playdowns, The Daughter also honed her skills at the rep volleyball level as a member of the Aurora Storm under-17 Bolts. 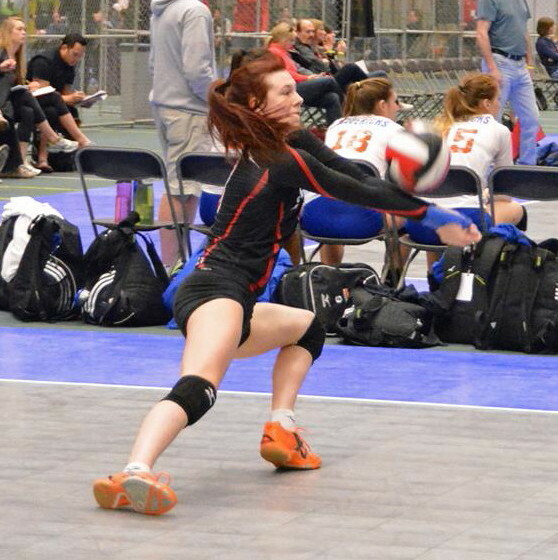 As part of the under-17 Storm Bolts volleyball team, The Daughter played an integral role in helping them earn a silver medal at the Ontario Championships in April, and a fourth-place finish at the Canadian Open Volleyball Nationals in Edmonton in May. While in Edmonton, The Daughter was honoured with another all-Star award, this time at the national level. One of only six girls picked out of the pool of 80 under-17 teams from across Canada, the all-star honour earned The Daughter a spot at the coveted High Performance Centre (HPC), an intense five-day camp at Nipissing University that was held earlier this month. The camp no only served as a place where the players practiced. At the same time it served as part of the selection process for the Team Ontario. Recognized for her talent as a left-handed, right-side player, The Daughter was chosen to be a member of Team Ontario, and will play on one of two Ontario teams that will take part in the National Team Challenge Cup. Way to go Lauryn! Nana is so very proud of you. Wow!!! That’s awesome! What an achievement. Congrats to your daughter and big hug to you, proud mamma! She wouldn’t be where she is today without your love and support. And knowing the dedication required for those special/advanced teams, I know it required a lot from your daughter and from you. Congrats again.